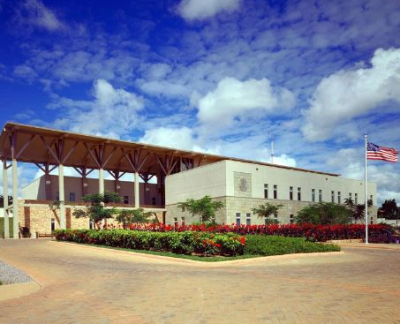 An embassy is permanent diplomatic mission and is often referred to as a head office of a foreign country. An ambassador heads an embassy mission in a capital city of a host country. Normally an ambassador of a foreign country has direct relations with the host country’s ambassador to the president. The roles of an ambassador range from overseeing the activities of the embassy & its consulates spread in the different cites, explain political views and polities of the home country to the host and then mediating between the two countries. Other responsibilities and technical duties of an embassy are economic, political and interests in diplomatic relations. Some countries may not have foreign embassies but get consulates to help travelers and expariates fromtheir home countries. A consulate is a miniature of an embassy. Consulates are small offices run under embassies although some countries only have consulate rather than embassies. Consulates are found in different cities and towns in a foreign country. Consuls are the overall head of consulates and thus are the official representatives of a foreign country in another. Where as a country has only one ambassador to send to a foreign country, several consuls can be appointed to the same country performing roles on behalf of the ambassador of that same country. Honorary consulates are offices that work under a major consulate in different cities. The roles of consulates include issuing visas, passports, registering births & deaths, handling marriage and divorce issues, emergency documentation, child abductions, deportations, crimes and many other concerns. The main duty of consulates is to work for the interests of expatriates and nationals living in a foreign country. Consulates also assist in handling cases of imprisonment of nationals in a foreign country and are the point of contact in case of death of relatives abroad, stolen passports, missing persons, crimes, trading activities, foreign investments and other services that general enhance the relationship between the two countries. Consulate general is the highest rank in a consulate and represents an ambassador (head of embassy). Under the consul general are vice-consuls, deputy consuls and agents. In a country like USA, a county like Uganda can have an embassy in Washington DC and have consulates in major cities like New York, California, Texas and Los Angeles run by consul generals. For countries that were once ruled by Britain and are members of the Common Wealth of Nations, an embassy is referred to as a High Commission and ideally performs the roles that any embassy does. Members of the Common Wealth maintain close relations and thus representatives of Britain to other countries are called High commissioners. Like the Embassy, a high commission is located in a capital city with several consulates in major towns. It is important to know the kind of problems or concerns to report to the diplomatic missions. Travel related concerns like stolen passports and real emergency business concerns. You may not at any one time make emergency call for trivial issues like missed flights, noisy neighborhood concerns, lost property and the like. Travellers are often encouraged to take travel insurance to cater for emergencies costs like medical treatment and lost travel documents while on your trip.